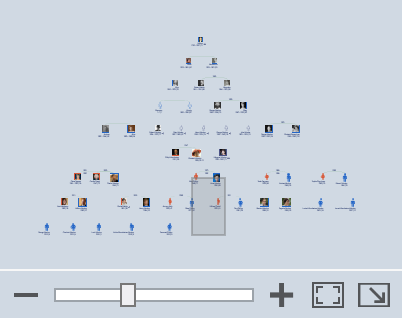 My Family Tree charts share a common set of controls for navigation and customisation. Controls for navigating the chart are found at the bottom of the view. Fig 1. The chart map and zoom controls. The chart map can be used to pan larger trees more quickly. Drag the highlight rectangle over the part of the tree you want to view. Click and hold to drag the chart. Single click a person to select them. Hover over a person to view their information. Hold and use the mouse Scroll Wheel to zoom in and out. Hold and use the mouse Scroll Wheel to change the date perspective of the chart. The charts can be manipulated using touch gestures on supported devices. Single tap a person to view their information. Double tap a person to select them. Move your finger over the chart to pan. The chart can be viewed as a full screen view for presenting. Press to toggle between normal and full screen view. Controls for customising the chart are found at the top of the view. Fig 2. The chart controls. To customise the charts click the button at the top of the view. By selecting the desired options, you can create a variety of family history charts. The chart updates in real time so experiment to see what each option does. You can view the chart as it would have been at any point in history. The date picker allows you to alter the day at which the tree is viewed and fades out people who were born after the time selected. The status of relationships, and the living status will dynamically change as you alter the dates. Hold and use the mouse Scroll Wheel to jump forwards or backwards in 1 year intervals. You can print or export an image of the the current chart by clicking the button.